Two models recently created on the new 3-D printer. 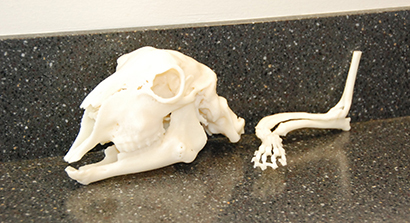 When Dr. Jennifer Warnock, orthopedic surgeon in the OSU Veterinary Teaching Hospital, has a complex surgery ahead, she often uses 3-D models of her patient’s bones to help plan the procedure. Thanks to a generous donation from Steve and Rebecca Camden, Dr. Warnock can now get those models from a laboratory down the hall, and they cost $20 instead of $200. 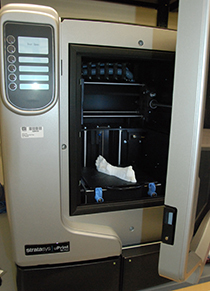 A newly ‘printed’ model of a bone awaits processing in a bath to reveal details. Data from a CT scanner was fed into the printer to create the model. Dr. Stieger-Vanegas is also looking at creating models that can be sawn into peices by Dr. Warnock.